Our range of products include fly insect killer, fly and insect killer machine, glue pad machine, mosquito killer lamp and fly killer. 25 x 3.5 x 10.2 Inch. 15 x 3.5 x 10.2 Inch. Machine Size (LxWxH) : 21" x 4.5 " x 13.5"
Outside Area : 250 Sq. Ft. Inside Area : 500 Sq. Ft.
We are a leading supplier and trader of Mosquito Killer Lamp. 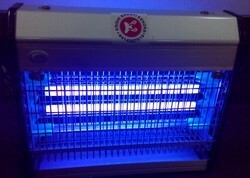 We are a leading supplier of Fly Killer. Looking for Fly & Insect Killer Machine ?